The continuing fuel scarcity in Nigeria presents an opportunity for the Nigerian government to take its commitment to renewable energy development more seriously. For several days, the crippling effects of fuel scarcity on domestic, social and economic activities have been witnessed across the country, a development that has disproportionately affected the poor and the vulnerable, especially women and female-headed households. Caused by the lingering conflict between the federal government and oil marketers regarding the payment of fuel subsidy claims, it is commonplace for citizens to spend longer times in queues at filling stations. The long fuel queues cause serious traffic gridlocks in major cities. The fuel scarcity has also propelled a thriving black market for petroleum products where a 10-litre fuel can be purchased at N2,500 ($12.5) instead of N870 ($4). 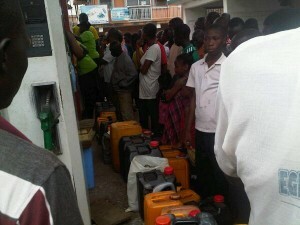 This translates to N250 per litre as opposed to the official pump price of N87. Because electricity is unstable, most citizens rely on petrol-fuel as an alternative source of energy, mainly to power generators in their homes and places of business. Fuel scarcity worsens electricity shortages, while imposing additional financial pressures on households and commercial enterprises. Dramatic increases in transport fares and in the prices of goods and services continue to put intense pressure on businesses and families, and women in particular. Because of the gender gap in income levels, women are likely to spend a greater portion of their income on fuel supplies needed to generate energy for domestic use such as cooking, heating, laundry and ironing. The scarcity equally forces women in the rural areas and those from poor households to increase their dependence on biomass fuels, such as firewood, with the attendant high health costs resulting from burning them. Productive hours usually spent on petty trading, farming, artisan and informal economic activities are lost during the long time spent on fuel queues, which significantly impacts on incomes generated during this period. With transport prices jerked up by almost 300%, this means many may be unable to afford transport fare to commute to work, and may suffer penalties for absenteeism, such as job losses and salary deductions. Taking urgent action to overturn the dependence on fossil fuels through aggressive investments in renewable energy sources, has now become imperative. Despite the revenue challenges brought about by falling oil prices and increasing exchange rate differentials, the Nigerian government has emphasized that it has always prioritized the “the issue of fuel subsidy payment to marketers.” In a statement, Nigeria’s Finance Minister explained that the federal government is currently engaged in dialogue with oil marketers, and has paid marketers N350bn ($1,758,793,970) in December and another N31bn ($155,778,894) in foreign exchange differentials, with plans to pay an additional N156bn; of which N100bn ($502,512,563) in the IOUs have already been issued with interest rate differentials of N56bn ($281,407,035). Removing subsidies unlocks potential savings that could be reinvested in developing alternative cleaner fuels derived from renewable energy sources, for the benefit of women and Nigerian citizens in general. Beyond addressing the issue of fuel subsidy payments, the fuel scarcity presents an opportunity to adopt measures to hasten the transition from a monolithic fossil-fuel economy to a more diverse economy sustained by a strong mix of renewable and non-renewable energy sources. In order to actualize its plans to add about 2,483 megawatts (MW) of electricity generated from renewable sources to the national grid by 2015, Spaces for Change calls on the Nigerian government to support the development of new technologies, including investment in critical infrastructure needed to facilitate renewable energy production in Nigeria. Renewable energy sources – such as solar, wind, hydropower from natural falls, flowing rivers, oceans waves and currents, biomass (wood fuel, ethanol, willow coppice, waste, and agricultural products and crop residues) – abound in Nigeria. Therefore, the renewable energy generation growth of 8 per cent and 16 per cent projected between 2020 and 2030 respectively is only realizable by developing sustainable financing solutions for accelerating the development and commercialization of renewable energy. It is also important to commit significant resources to programs and initiatives aimed at increasing institutional capacities to utilize next-generation technologies to bolster the availability of alternative cleaner fuels. The availability of alternative cleaner fuels not only lessens the adverse impacts of electricity shortages on vulnerable segments of the population in times of fuel scarcity, but is also necessary for the substantially reducing global greenhouse gas emissions. Citizens and business enterprises would like to see the scarcity brought to an end within the shortest possible time. Support the development of new technologies, including investment in critical infrastructure, to facilitate renewable energy production. Commit significant resources to programs and initiatives aimed at increasing institutional capacities to utilize next-generation technologies to bolster the availability of alternative cleaner fuels.